Patna, Jan 27: Independent legislator and criminal-turned-politician Anant Singh, popularly known as Bahubali, on Sunday joined the Congress road show here in support of party President Rahul Gandhi's rally in February. Anant Singh, who is facing several criminal cases, was seen along with Rajya Sabha MP and former Union Minister Akhilesh Singh and hundreds of other party members in the road show to mobilise people for Gandhi's rally on February 3 here. The Congress is busy organising an anti-BJP rally - 'Jan Aakansha' - at Gandhi Maidan here. This is the first time in 28 years that the Congress is holding a massive rally in the state on its own. Both Akhilesh Singh and Anant Singh belong to the Bhumihar caste, which is widely seen as the vote bank of the Bharatiya Janata Party (BJP) in Bihar for over two and a half decades. 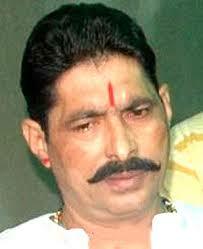 Anant Singh, independent legislator from Mokama Assembly constituency of Bihar, is known for his muscle and money power. He said that he would contest the upcoming Lok Sabha polls from Munger parliamentary constituency as a Congress candidate. Akhilesh Singh said it is not yet decided who will contest from where as talks are ongoing with allies regarding a Grand Alliance. In 2015, Anant Singh resigned from the ruling Janata Dal-United and contested and won the Assembly polls from behind bars. In the past, he has been arrested several times for serious crimes like kidnapping and murder. At present he is out on bail.